The iPad Mini has been the 7 inch mini-tablet to beat since its launch. 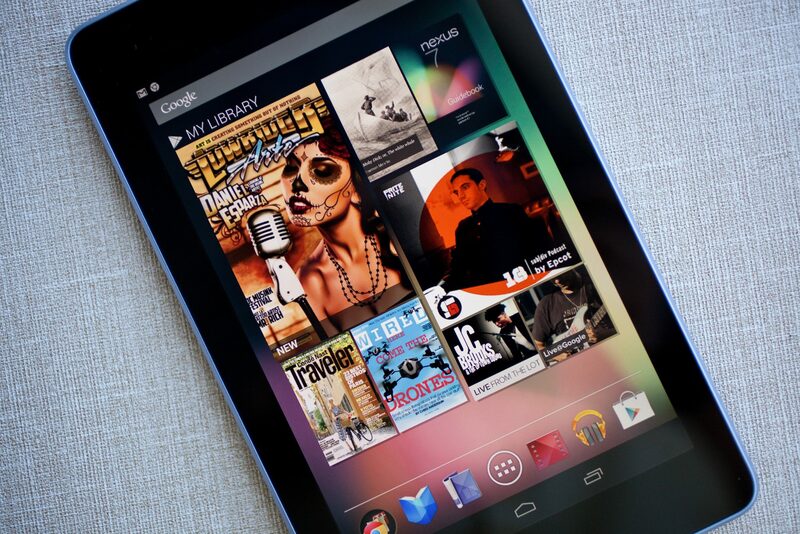 However, the upcoming Google Nexus 7 2nd generation could be set to challenge that position. We revealed yesterday that the Nexus 7 2 has been found in leading online retailer stores a week ahead of its scheduled launch, something which has drawn plenty of attention. The interest in this new 7 inch tablet has been so strong, that the story we ran has become the most popular post (judged in its first 12 hours) in the history of Burntech.TV. Its evident that the Nexus 7 2 is going to be a bi hit, and its also evident that anybody who is in the market for a new small tablet is going to have quite a choice to make. 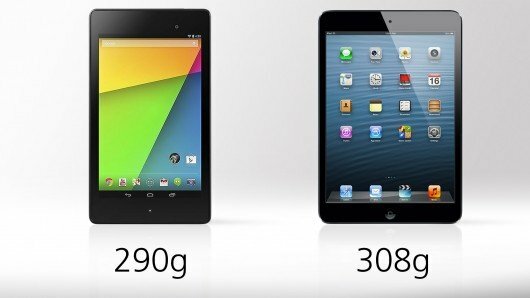 Below is our guide to the Nexus 7 2nd gen verses the iPad mini. I terms of the best utilisation of space, the iPad mini seems to be the winner here. Whilst both tablets stand at roughly the same height, the iPad mini is able to extract a useful extra 2 cm of width. This is allied against a thinner overall design, the recent haul mark of Apple, giving the iPad Mini the better layout in our opinion. The Nexus 7 2nd gen comes in slightly lighter, although the iPad has greater surface area. If we are judging on a size to weight ratio, the iPad is the lighter device by 8 percent. 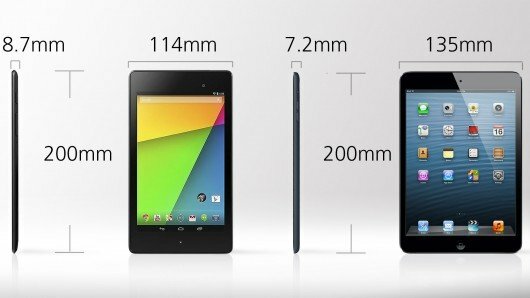 However the narrower Nexus 7 design means that it is able to weigh in slightly less than the iPad, although at a mere 18g, we are splitting hairs slightly. 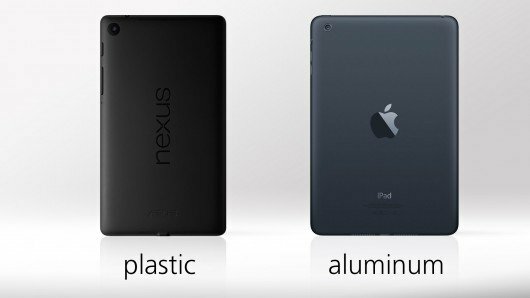 The Nexus 7 2 is made of plastic, verses the aluminum of the iPad Mini. Both are exceptionally lightweight materials, but the plastic feel of the Nexus struggles to live with the higher quality feel of the iPad Mini’s aluminum. Thankfully, the new Nexus 7 lacks the rubbery feel of last years model, as they’ve opted for a matte plastic finish which is more refined under finger. The iPad Mini is the less ‘mini’ of the two devices, sporting an additional .9 of an inch of screen real estate. This does not sound much, but does make quite a difference to the overall experience. 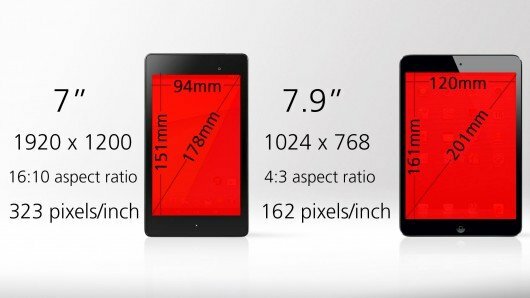 Interestingly, 0.9 of an inch becomes far more significant when you measure the square MM of available space, as the Nexus 7 2 comes in at only 74 percent of the screen size of the iPad Mini. Probably of ore interest, is the hugely btter screen quality that the Nexus 7 2 features. The iPad only has 34 percent of the pixels sported by the Nexus, and this makes a massive difference. With the iPad Mini 2 expected to boast of the Apple retina display, this gap will close (or even swing) but it does serve to highlight the aging position of the current Mini gen one. Neither tablet is likely to be your core camera of choice, but a tablet camera can come in surprisingly useful. Both devices feature a front and a rear camera, and the two devices have matched each other spec for spec. 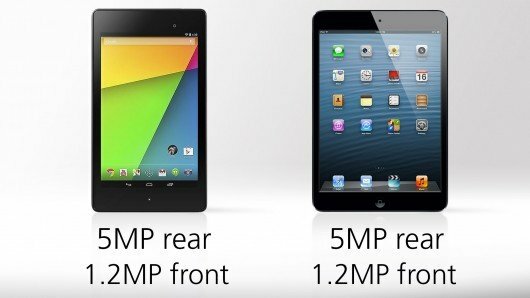 Will the iPad Mini 2 break ground and sport a more potent camera, or will Apple decide that this is not a core area to try and gain ground on the Nexus 7 2? Battery life is a core area on any tablet. The iPad mini has gained a reputation for having great battery performance. Considering the much more powerful Nexus 7 2 screen resolution and its lower spec battery, there is something of a red flag here. If battery longevity is a really core consideration for you, its likely that the iPad Mini remains your best bet. However, the Nexus 7 2nd gen will feature wireless charging. This will make it markedly easier to get charge into your device on the go, an could negate the downsides of a lower spec battery. As you would expect from an Android device, the Nexus 7 2nd generation will b the cheaper of the two. This is set to be the clincher in our opinion; the Nexus 7 2 has at the very least stood its ground with the iPad Mini at very stage of comparison, yet comes in a whopping $100 / 60GBP cheaper. It is therefore really hard to argue against the Nexus 7 2nd generation. It is the first super-definition screened tablet, is the much more recent and up to date device, and it features some other nice additions, like multiple user accounts and wireless charging.